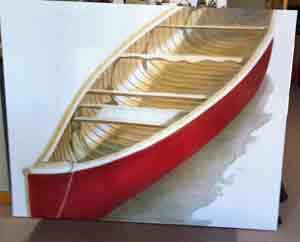 Red Canoe #10 (Work In Progress - Pic.3) ©2011 Janice Tanton. 36"x72"
Well, I’m almost there! These two monsters should be completed by the end of the day today, especially if it warms up a bit! Red Canoe #11 (Work In Progress - Stage 3) ©2011 Janice Tanton. 48"x60"
Check out the earlier stages of progression on these two Red Canoe oil paintings and the between & betwixt stages of Pt. 2 from underpainting to glazing.